So, I’ve been up to a whole lot of not much garment sewing this month. Seems like I’ve been more into reading, watching shows that people half my age enjoy (Secret Life of the American Teenager, anyone? ), and continuing to sew up blocks for my Christmas quilt (LOL…I WILL FINISH IT!!! Someday.). I have, however, managed to purchase a few goodies. I sewed a bunch last month and bought very little fabric, whereas this month I sewed very little but bought a moderate amount of fabric. Oops. My laptop also bit the dust this month, and I’m writing this blog post on my very first night with the new machine…a ThinkPad 430. I’m hoping this computer will be a utilitarian beast which will last me for years to come, instead of the paltry 2 1/2 the last one (an HP Envy 17) lasted. Crossin’ ma fingers. 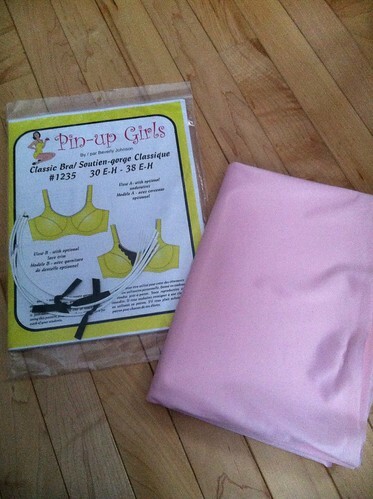 Pin-up Girls Classic, duoplex fabric, und underwires auf Deutschland!